This weekend was quite good for Trak.in, it got featured in Times of India. 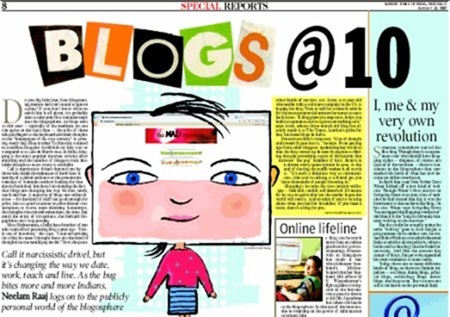 If you are one of the readers in Delhi, India, you must have already seen the special report on “10 years of Blogging” that appeared in Times of India Delhi Edition. Trak.in was mentioned along with two other blogs (One is the usual, Amit Agarwal). Like I have mentioned here, the visitors and subscribers to this blog have been growing constantly and that has given me a boost to write more on Trak.in. One of the things, I have mentioned often on my blog, “In a few years time, blogging will be as important a tool as Email is today “. Here are the 10 reasons why I blog, and why you should start blogging today. You have excellent free and easy to use blogging solutions, Blogger and WordPress. Both are extremely easy to use and you can start publishing your first post within minutes of registering. If you are new to blogging and need some help, contact me, or mail me back at admin (at) trak dot in. I will be glad to help you get initiated in blogging. Just discovered your blog. Nice one. Well there is not sufficient information about you on the about-me page. Hope you will update it soon. Not giving my email id to your Feedburner this time. Thank you Ashwin, Indian Blogger and Ashok R, I am glad that you guys like to read my blog. I will surely be adding more info about myself to the existing about page that I have. Google Alert brought me to Trakin page last week. Immediately I subscribed to the feeds of Trakin. Incidentally, I read the said article in TOI Mumbai edition on Sunday. The success of your blog lies in the fact that contrary to visiting the blog after reading about it in newspaper, by the time we read it in TOI, we were familiar with the blog. All the best. Congratulations Arun. I had actually read this TOI article in the Mumbai Edition. Keep it up. You are really doing a fantastic job. Cool..I read about your blog in the paper yday and was impressed. You certainly do an excellent job. Keep it up. Your thoughts involve a lot of research, news clipping..and is always backed with data..something that I really like about your blog. Could you please write something about yourself.